This figure illustrates the stitching module pipeline implemented in the Stitcher class. Using that class it's possible to configure/remove some steps, i.e. adjust the stitching pipeline according to the particular needs. All building blocks from the pipeline are available in the detail namespace, one can combine and use them separately. The implemented stitching pipeline is very similar to the one proposed in  . There are currently 2 camera models implemented in stitching pipeline. 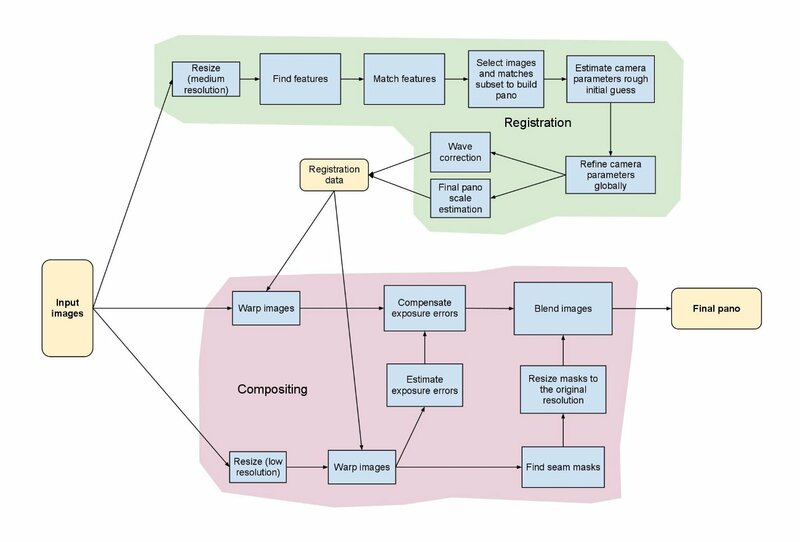 Homography model is useful for creating photo panoramas captured by camera, while affine-based model can be used to stitch scans and object captured by specialized devices. Use cv::Stitcher::create to get preconfigured pipeline for one of those models. Certain detailed settings of cv::Stitcher might not make sense. Especially you should not mix classes implementing affine model and classes implementing Homography model, as they work with different transformations.